Rosario Dawson. Science Fiction. And a title that sounds an awful lot like one of my favorite sci-fi novels: The Cassini Division. NBC's new webisodic series Gemini Division seems to have all the elements of a smash hit. So why has nobody heard of this thing? For starters, take a look at this promotional clip for the show, which debuts on August 18th. If you watch the clip you'll be only the 81st person that's actually done so (as of this writing). I think more people have viewed my lawn than the show's promo material (actually my lawn gets pretty good numbers on YouTube, so maybe that's not a fair comparison). The thing I really don't understand is that with Rosario Dawson leading the cast they should have viewers lined up around the block for this thing. Here's the promo she did for her last film, Death Proof. Though this kind of salacious advertising turns away her female fans she can certainly pack a theater with young men. 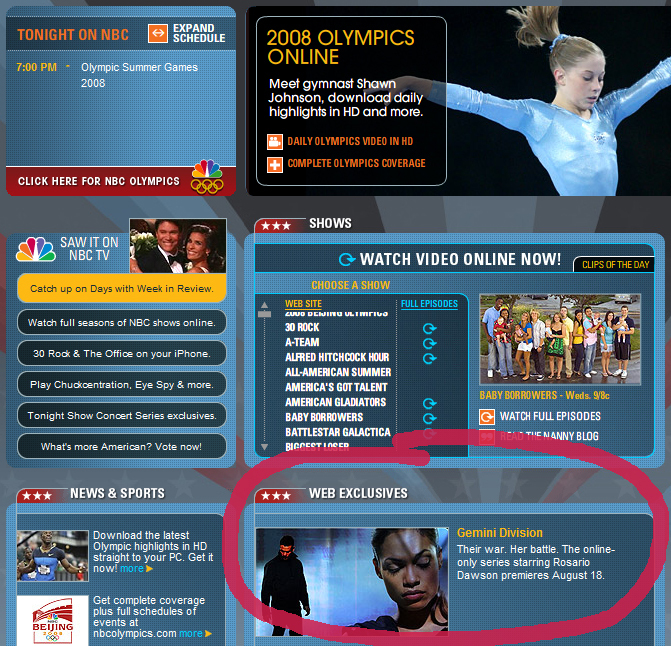 Also, the show is prominently displayed on the homepage of NBC.com. And did I happen to mention the fawning seven page review of the show in this month's Wired? So what went wrong? The first problem with this show is that it's entirely built around advertisers. Watch for more Cisco product placement than you can shake a VoIP phone at. Next, the site that is hosting this show is entirely devoid of community. While the NBC parent site does allow you to sign up and create an online presence, the Gemini Division site doesn't recognize the login. There is a long, gruesome thread about the broken login system that plagues NBC and I can confirm (after several attempts) there appears to be no way to login to the Gemini Division site. Which is literally the best way to infuriate the online community. As an independent filmmaker I see the arrival of advertising driven webisodes (starring household names) as both a blessing and a curse. It creates a new employment path for film students that want to get into the business, but it also crowds the space that was previously owned by really sincere, offbeat individuals that would otherwise be asking you if you wanted fries with your burger. Should slick dealmakers like Stan Rogow (the show's producer) take away the creative outlet of these folks? There are those that would argue there is plenty of space for both types of productions, and that you can simply ignore the commercial webisodes if you so choose. From the lowly numbers that Gemini Division is turning in it looks like that is exactly what viewers are doing.